Nittany Lion football fans will never forget the euphoria they felt after an unranked Penn State team shocked No. 2 Ohio State, 24-21, on October 22, 2016. Wasn’t that the sweetest block of a field goal you ever saw? 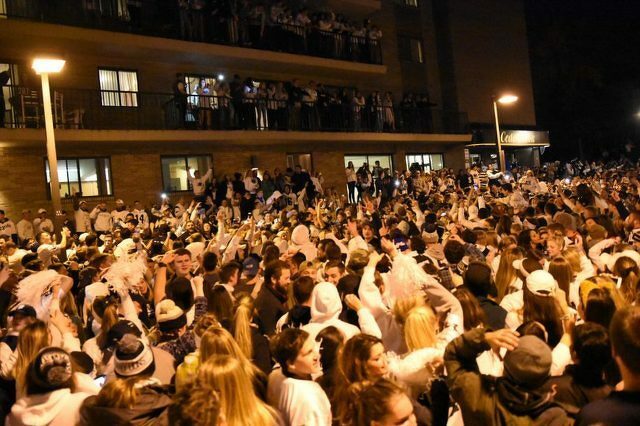 Unfortunately, we felt sadness and shame the next morning when we heard about the destruction that befell downtown State College after the late night victory. As many as 10,000 fans swarmed the downtown area in a classless and senseless celebration that was described by some as a “riot.” Fans destroyed street lights, road signs and utility poles, creating a power outage and leaving behind some $30,000 of total damage. So let’s say that the Nittany Lions pull off another Beaver Stadium upset over Ohio State. (That’s what I expect as quarterback Trace McSorley enjoys the absence of Buckeye defensive end Nick Bosa and the support of a White Out crowd.) Penn State students and other young fans are going to party, right? But isn’t there a way they can have more fun without wrecking the downtown? FUN ON ALLEN STREET: The downward slope of Allen Street is a clear invitation for post-game frivolity. Could Centre Region Parks and Recreation place a massive “Slip ‘N Slide” down that slope? It wouldn’t take much—just the foresight to remove all cars and block off Allen and the installation of impact-absorbing boundaries, especially at the bottom of the hill. We don’t want our sliders ending up in College Avenue’s traffic. BLUE BAND PARADE: I don’t know about you, but I’d love to hear the Blue Band play “Fight on State” while marching down College Avenue after a win over Ohio State. Who should lead this parade? Of course, we all love the band’s drum major, but I’d like to see Sue Paterno — one of State College’s most inspirational figures — walking or riding at the very front. THE ULTIMATE ICE CREAM SOCIAL: If our community has the best in ice cream — and we do — then why not have the best celebratory experience with that ice cream? Whether the good stuff is provided by Berkey Creamery or Meyer Dairy, it matters not to me. And whether it’s funded by Penn State, State College or the individual consumer, it’s all good. But I can picture a wonderful experience of ice cream consumption on Old Main Lawn, and the only stipulation is that we should devour nut-based flavors in memory of the Buckeyes. It would make sense to offer the Gyeondyo-bar, a South Korean ice cream that contains grapefruit flavoring and an ingredient that has been used to treat hangovers since the 1600s. TO-GO GOAL POSTS: In the good ol’ days, the tearing down of the goal posts was deemed an appropriate and acceptable way to celebrate a big win. I’m wondering who it was who said that had to change. Of course, there may be a concern that students could be hurt while wrestling with heavy steel posts. If so, I’d like to suggest that Penn State pioneer in designing a removable and relatively light-weight goal post that would present little risk of injury as students proudly carried it around campus. NO SCHOOL ON MONDAY: We’ve all heard about universities that cancelled classes in honor of a major athletic achievement — typically an NCAA championship. Perhaps a win over Ohio State falls slightly short of that standard, but what about beating the Buckeyes and refraining from post-game mayhem? My son, Steve, suggests that such a dual accomplishment would be worthy of a one-day holiday. It could be declared by the university on Sunday — after administrators felt certain that peace had prevailed. WHAT’S YOUR IDEA? Although I promised seven ideas, you’re a Penn State fan and you can count well enough to realize I’ve only presented six. I’m stopping here, dear reader, so you can offer your idea as number seven. Just click on “Comments” and describe it. As for the “contest rules,” let’s keep things clean and classy with just a hint of sarcasm directed at our friends from Ohio. No doubt, your idea will be better than mine. Maybe you’ll be the author of a new Penn State tradition. Bill Horlacher is a native of Happy Valley, a 1970 graduate of State College High School and a 1974 graduate of Penn State (journalism). He has spent his last 30 years in service to international students, helping them with personal, cultural and spiritual adjustments to America. After 39 years of living in California, Maryland and Texas, Bill returned to State College in 2013 along with his wife, Kathy. 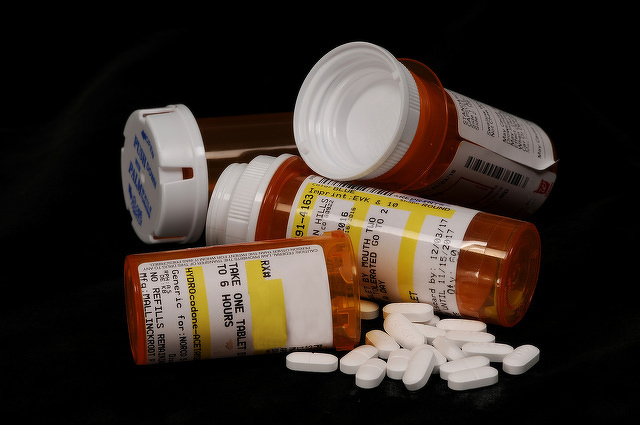 Pennsylvania’s opioid epidemic has left no part of the state unravaged, no demographic group untouched.